To be honest I’m not a lover of duck, but I know I’m in the minority. This 70s recipe comes from a booklet put out by the Australian Wine Board titled ‘Bacchus in the Kitchen’, which paired dishes with wines. The suggestion for this recipe is to serve it with a dry red. 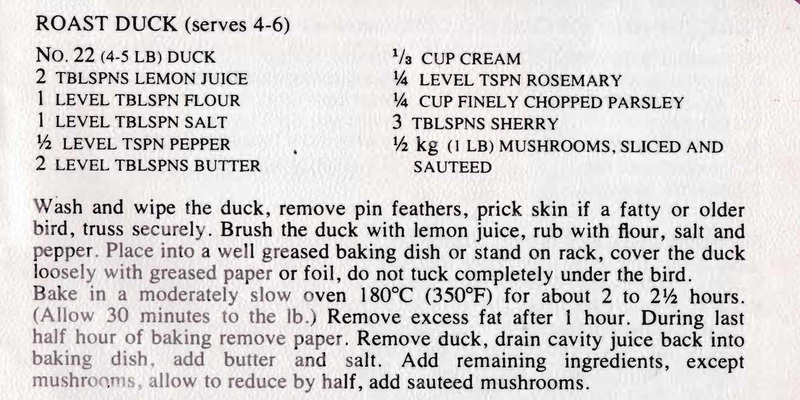 This entry was posted in All Recipes, Chicken, Main Dishes and tagged 1970s. roast duck, cream, duck, lemon juice, mushrooms by bebsrecipes. Bookmark the permalink.